Our span roofing has a square corrugated appearance that highlights a mix of light and shade, wherever it is placed. We are proud to introduce a great selection of different span sheeting options for your home or workplace. Span roofing blends perfectly with a wide range of building styles. 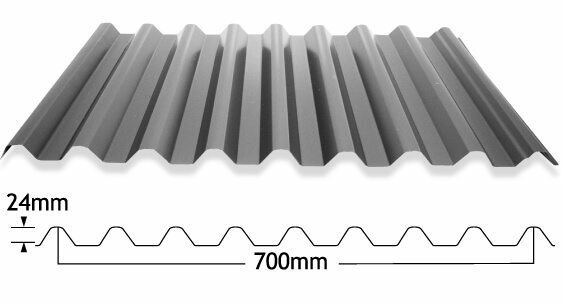 Its 9 rib design means it can be used in walling and fencing, as well as its trademark roofing applications. Our span roofing has been used on walkways, school buildings and heavy duty walling all throughout the state of Queensland and beyond. Span roofing is perfect for those who are after a more unique and nuanced look, while also being extremely practical. Available in a range of different colours, span cladding is just the thing for your home or business. Using span cladding can also lead to great cost savings. Span roofing can be used in continuous lengths when large support gaps are utilised, meaning less sheets are ultimately used. When installing span sheeting, you should always remember to lay the material into the prevailing wind and sit neatly on the preceding roof sheet. Never stretch the width of the sheet at any time during the installation process as this can lead to wind or rain penetrating the newly installed sheeting. You should use side lap fasteners at mid span whenever the spans exceed 900mm for roofing or 1200mm for walling. Utilising side lap fixing will help enforce a weather proof seal and secure the sheet overlap. It is important to note that all fasteners used should have neoprene washers.